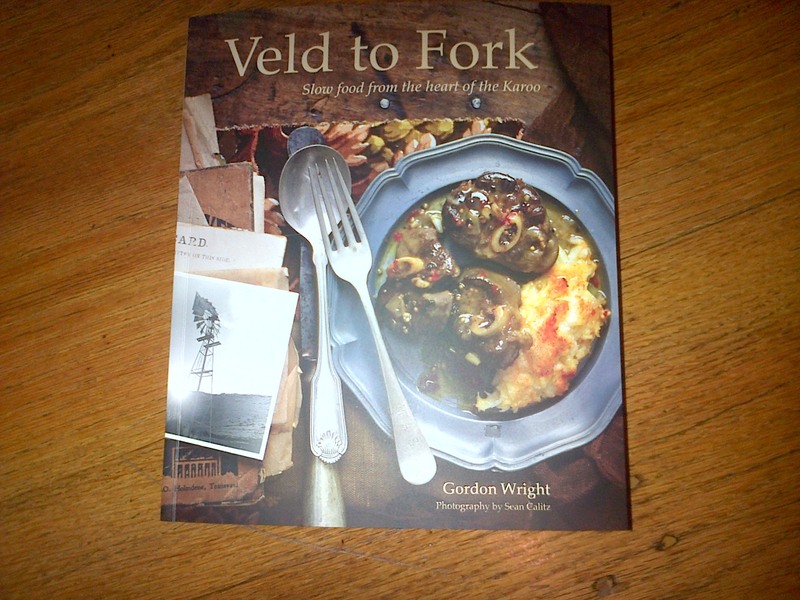 Watch this space for more about my trip to Graaff-Reinet this weekend for the launching of Gordon Wright’s book Veld to Fork! Yes, we had no turkey! But we did have Karoo mutton and lamb and chicken and eggs and chops and pizzas and red wine and Guiness and Castles and …. in fact, we had far too much. 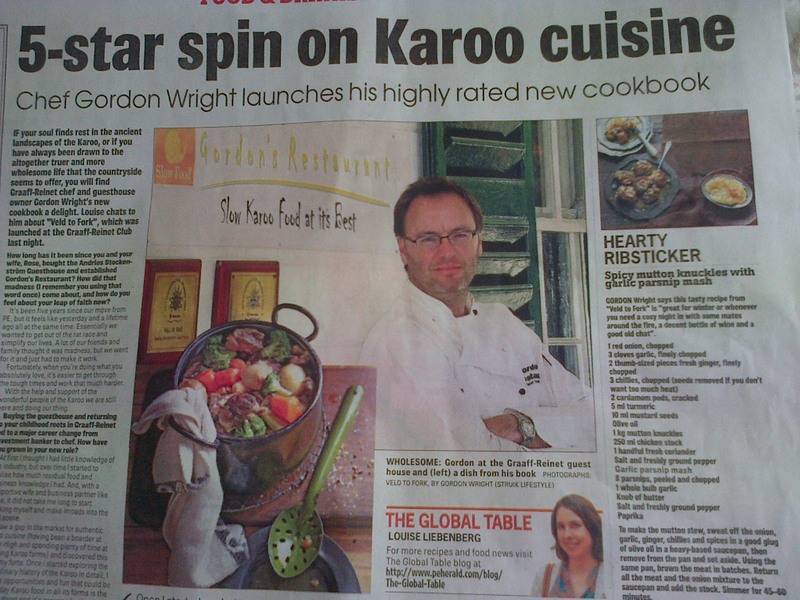 However, this is Karoo hospitality and whilst we had too much to eat and drink, one can never complain about the Karoo hospitality that one experiences when visiting Graaff-Reinet! There is so much of it that one must be careful not to drown in it. 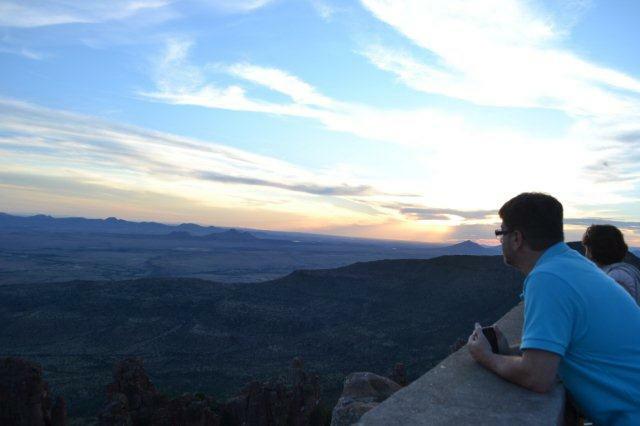 The reason for our hurried trip was indeed a thanksgiving: to give thanks for the life of Richard Clarke who died in the most bizarre set of circumstances on the national road between Graaff-Reinet and Aberdeen last week. 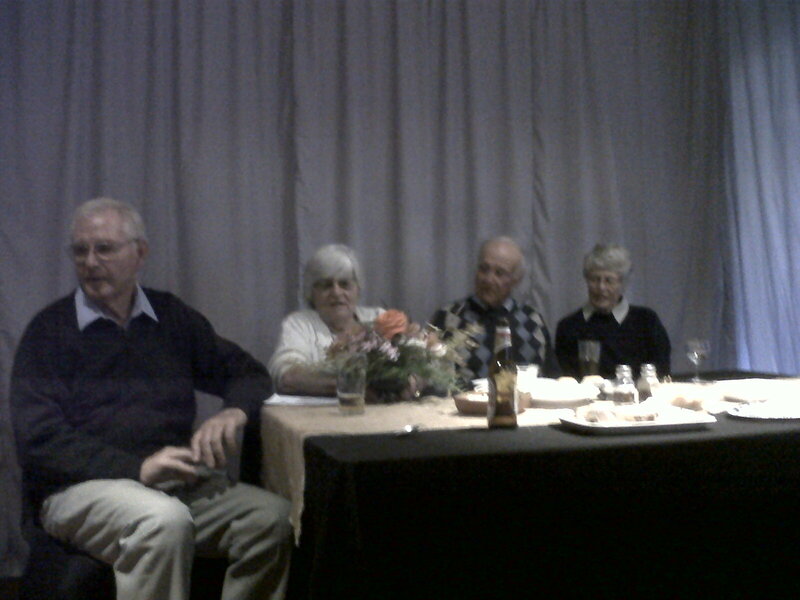 I first met Richard “online” when he started commenting on the blogs that I had written about fracking in the Karoo. 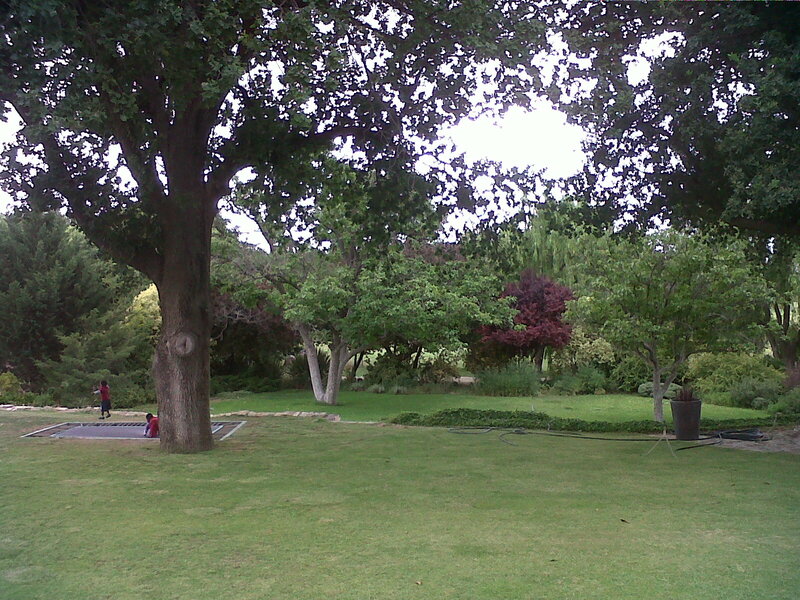 Then, one day, we met face to face at that rather hospitable Graaff-Reinet (Mens?) Club where there always seems to be a reason for saying thanks and for saying “Cheers”! Richard and I discussed numerous issues – he liked that and so did I, and sometimes it was necessary to have just another ale in order to cool down the intense debate! And whether we met at the Club or on the street of Graaff-Reinet, there was always that blue-eyed smile and those deep words of discussion! It was only later that I “discovered” that Richard was my radio interviewer, Lance du Plessis’s, cousin. 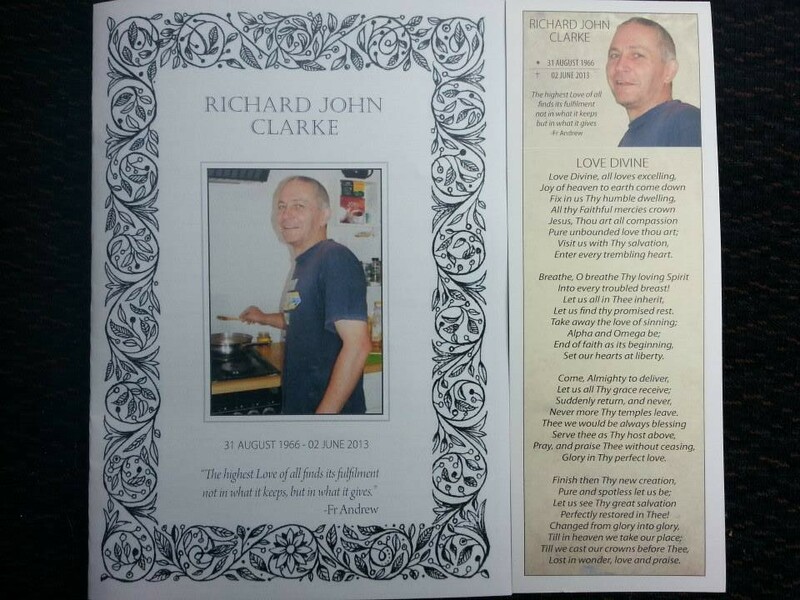 So it came as a shock last Wednesday, just as we were about to go on air, that Lance informed me of Richard’s death. My sincere sympathy and condolences go to all his family and friends. I shall miss his sharp intellect, his fine debating skills and that blue-eyed smile. 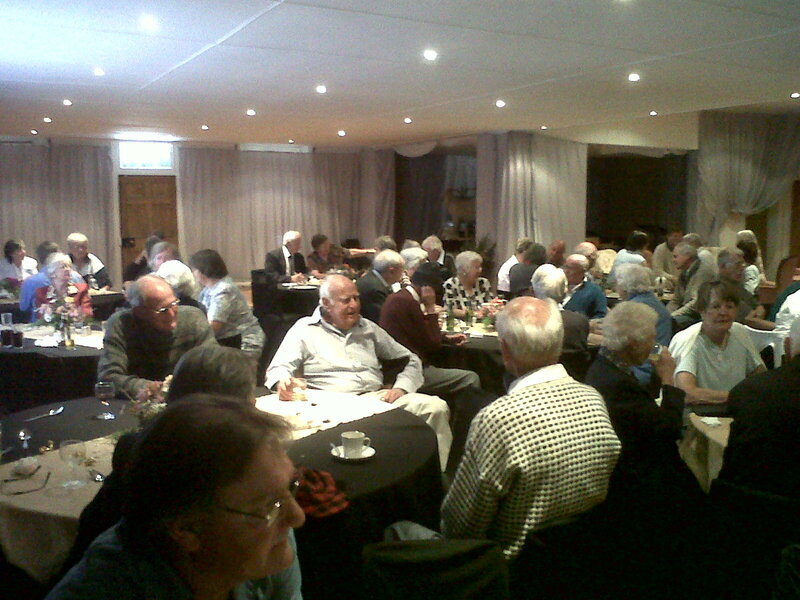 I shall have another reason to drink an extra Guiness when next I visit the Graaff-Reinet Club. People supporting fracking Shell for jobs should beware the wolf in sheep’s clothing. I attended the meeting on fracking at the Graaff-Reinet Town Hall on Thursday 18 April and I did not hear anything new from Shell. It is almost two years ago that there was a massive meeting at the same spot and Shell still have no answers to the questions about water and about jobs. There are no guarantees about jobs or water. There is no certainty that there will be jobs and no certainty that the water is safe and won’t be contaminated by chemicals used in the drilling process. Shell SA is a part of Royal Dutch Shell which as a Multi-National Corporation is there to make money, otherwise it does not exist. Shell is not terribly worried about whether people in the Karoo get jobs or whether they can continue to drink their water. 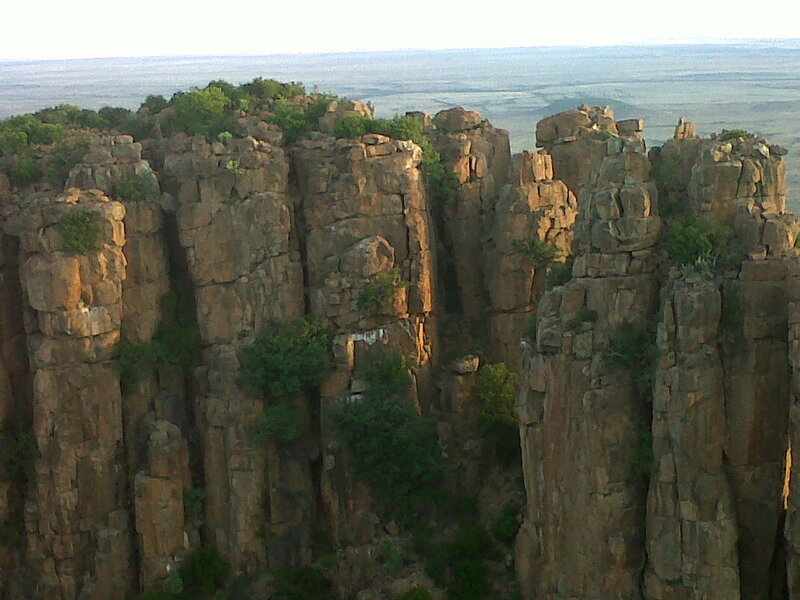 There is shale gas in the Karoo and that can be turned in to money. This is the bottom line in any calculation or analysis by Shell. The same arrogance and even contempt for the Karoo locals was on display yet again as we were told that people concerned about chemicals are being “emotional”. At question time this lack of respect was shown in the contempt with which one of the Shell delegation fobbed off a question around the recent article in the National Geographic about the ever present dangers in mining and hydraulic fracturing (fracking). The presentation itself has not altered much in two years and Shell simply speak of job possibilities in the “multiple 1000’s” like a lottery which of course means that they are not sure and don’t want to be caught out. The local community has become split over fracking with some irresponsible people encouraging the split along racial lines with whiteys anti because they don’t need jobs and blacks pro because they want jobs. This is simplistic and done purely for political gain. The reality is that both of the groups should be together pressurising Shell to come clean on these issues of jobs and water. There is no guarantee that there will be jobs and no guarantee that the groundwater will survive this Shell onslaught. We have an elected government in this country whose job it is to protect the citizens of South Africa against this kind of invasion by a Multi-National Corporation that is richer than many countries. An elected government that should controlling and monitoring the process by which rights to mine are granted. Controlling and monitoring the process that Shell seems to running on its own. Shell at this meeting looked like a player in the game and the referee as well. There is still a long way to go in this fight and people that support Shell and fracking because they believe it will bring jobs should beware the wolf in sheep’s clothing. PS >>>>> Happy birthday John! New Year’s Day – my 56th one! I have not been very good at keeping my blogs up to date over the last few weeks. It’s not because I have been busy. On the contrary, life has been unusually quiet during this time. It’s just that I haven’t felt well, haven’t been able to type, haven’t had the urge or inclination to write, and most of all, just haven’t been able to sit down for any periods of time. Try writing standing up! Whoever would have thought that the CBD would have taken the act of sitting away from me too! All this time we have spoken about when time would come to sit in a wheelchair – now the very act of sitting would seem to preclude that from me, too! My short-term memory is also becoming more problematic. However, for the record (which these blogs – “weB LOGS”) are supposed to be) let’s try and fill in the gaps of the last few weeks. The rugby test in Port Elizabeth in August this year set in motion a chain of events that resulted in my visiting Graaff-Reinet a number of times over the last few months. 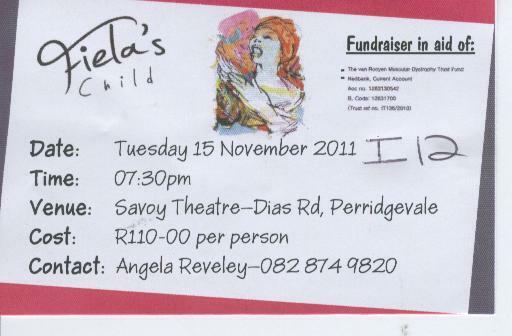 Then we went back for the Karoolus Fees. That resulted in me meeting Ed and Margie Parkes and being invited to speak at the Graaff-Reinet Cancer Society Christmas Dinner and the St James Anglican Church Men’s Breakfast Group. Then, I spent a number of days with Gordon, Rose, Graham and Helen and their families both in town and out on the farm. I was planning to stay longer, but had to return to Port Elizabeth for a public meeting at the University regarding the fracking (hydraulic fracturing) process that the oil companies have applied to government to initiate in many parts of our country – including our beautiful Karoo! A few months ago, I had also been invited by Howard Sheard to spend time at their farm Weltevreden just outside Nieu Bethesda (a hamlet just 30 minutes north of Graaff-Reinet). So when my niece Michelle and her husband Sebastian told me they were coming to visit for Christmas, I decided it was time to take Howard up on his offer and visit Nieu Bethesda. In between all this travelling I had been experiencing increasing problems with the ongoing spasms down my left side. It has especially been making sitting down problematic and life quite uncomfortable. So, desperate times called for desperate measures. 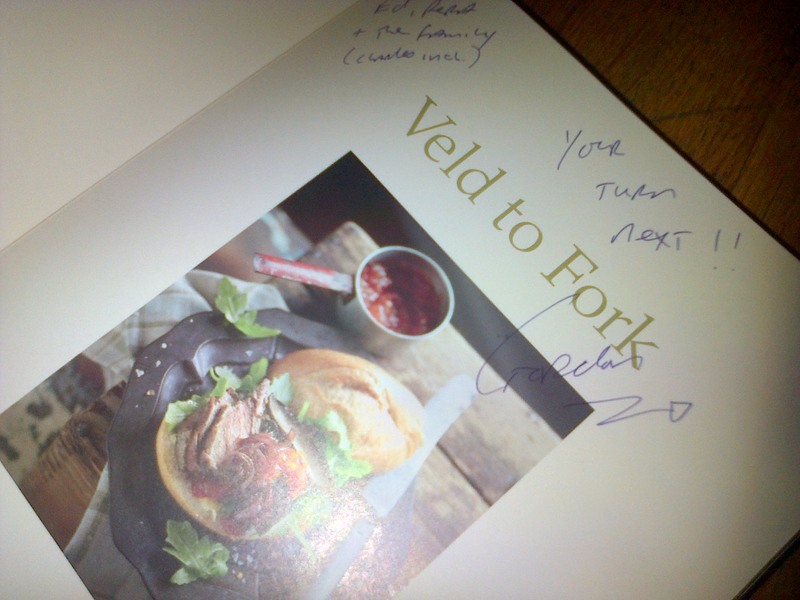 I started seeing Dr Fanie Smit (and with the input of my neurologist) I started becoming a bit of a guinea pig! First we would try cortisone. 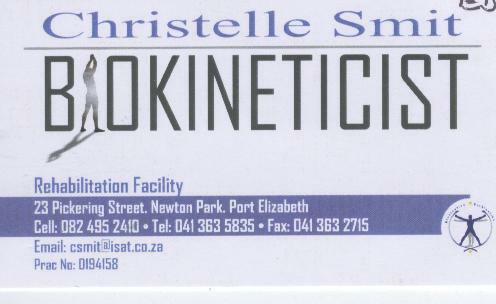 I would also go for hydrotherapy (water exercises) with biokineticist Christelle Smit. At one stage I was taking twenty five tablets a day (my daily Carbilev, Lyrica, cortisone (Prednisone), Norflex and Lexamil. I call my medication my Polyfilla – none of it will stop the progress of the CBD, slow it down, reverse it or stop it completely. It only helps to cover up the symptoms and so, like polyfilla, is just a cosmetic assistance to make things look good – “but you look so good” is what so many people say to me. Yes, I do look good – thanks to all the pills. I program the pill times into my Blackberry so that I don’t miss a dose! Heaven knows what it is doing to my insides, and whilst I may look good, I certainly no longer feel all that well – and sometimes I wish I felt as good as I look! At the same time Christelle (my biokineticist), together with André from Knights Orthotists, have been working on a device to assist with my errant left leg. Let me explain: as my brain loses control over my muscles, they contract (like elastic bands that go from a stretched to an unstretched position) and hence my limbs fold up leaving me in the foetal position. So when I stand, my left leg bends at the knee and comes up like the leg of a flamingo, with my left foot at my right hip! Therefore, they have devised what I call my scaffolding – it’s a metal brace construction that prevents my knee from bending and at the same time gives me strength to put weight on that leg. Besides a few teething problems and slight modifications, it works well (other than making my leg much weaker when it’s off as the leg becomes dependent on the support that the brace gives). I have been able to put away my walking stick for a while! With all these various treatments at the same time, it is difficult to say what exactly is stopping the spasms and making it so much easier to sit. Is it the exercise, the brace, the medication …? 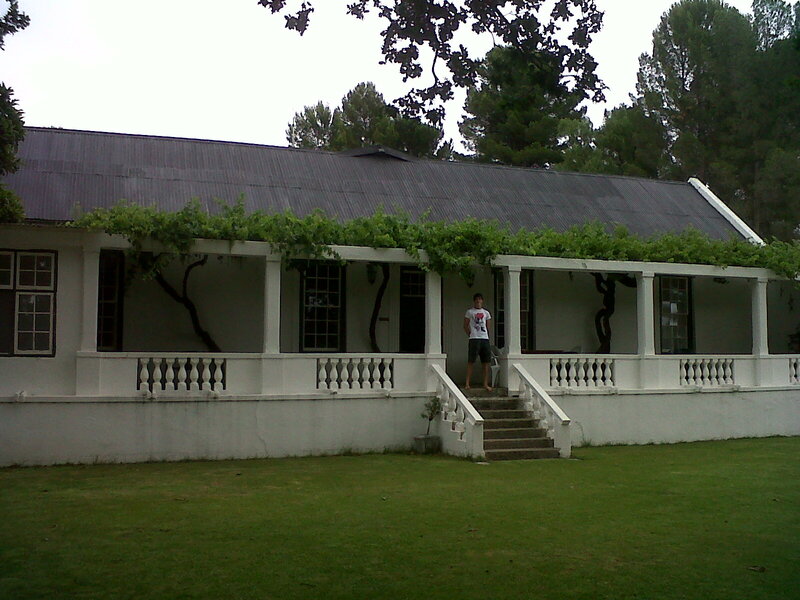 Anyway, it was the week before Christmas when we headed off to Nieu Bethesda, this time with Charlie who would visit his mother and siblings for the first time since moving from the Karoo to the coast. I had just started my dose of quinine. Tuesday, we spent visiting some of the historical places of interest in Graaff-Reinet until a violent Karoo thunder storm put an end to our walk ‘round the town. Then out to Tandjiesview, and our six, together with Graeme’s family, his parents and his cousin and his family of four, sixteen of us sat down to our first Christmas Dinner of the season! 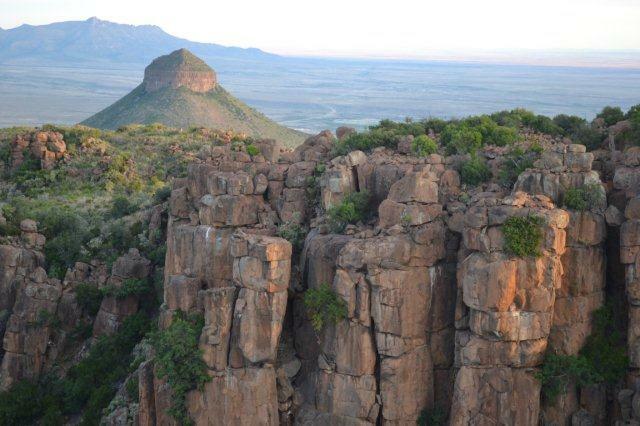 Wednesday morning we moved on to The Valley of Desolation and a trip through the Camdeboo National Park. Later, we went onto Nieu Bethesda for lunch and then out to Weltevreden (meaning “well-satisfied/content”), some thirteen kilometres west of the hamlet. The rest of the day, as the travel brochures put it, “was for exploring at your own convenience”. What a beautiful farm at the base of the tallest mountain peak in the Eastern Cape, the Kompasberg (the Compass Mountain). There we had Lisa and Miemie, farm domestic assistants to look after us, and in the absolute stillness of the evening, we sat down to our first braai of the week, and watch Miemie’s family of pigs stroll across the beautifully manicured front lawn! 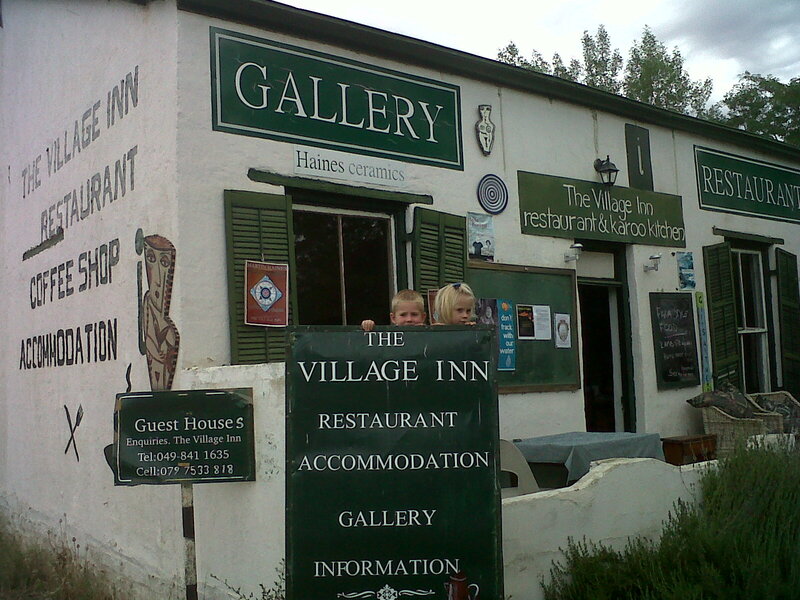 I have learned to push on … so Thursday was spent exploring the hamlet: art galleries, pottery shops, The Owl House, the local Brewery and Cheese producers, the cricket oval … and still so much more to see. A return visit is a must for the New Year! Friday morning, all too soon, the Ridgeways headed back via Aberdeen and Beaufort West to the Western Cape, and we returned to Port Elizabeth. By then I was really feeling miserable and had also broken out in a red rash all over my arms and legs. A visit to Dr Fanie brought to an end the quinine experiment, and so after a week, the quinine tablets were stopped, and with that, almost immediate relief from some of the side-effects. For the next week, this guinea pig will not be taking any additional medication, and so now I am in that period of cold turkey. Let’s see what happens and we will resume trials in the New Year! Saturday was Christmas Eve, so some last minute shopping preceded our family-of-four Christmas Eve dinner, lamb and gammon! Sean returned from St Francis Bay, where he has been working at Cob’s Cove, and we spent a quiet evening together, and opened pressies on Christmas morning. It was the first time in many a year that we were not attending the Christmas Service in the Bowling Green Hall in St Francis Bay. I missed that! It seemed impossible that a year had passed since our last Christmas service there! Anyway, we move on … through what Lance calls the Twilight Zone – the week between Christmas and New Year. I lose track of days at the best of time now. Add to that public holidays, and more public holidays (the government created an extra one this year on the day after Boxing Day … Tuesday, I think that was! ), and I lose track of time completely. 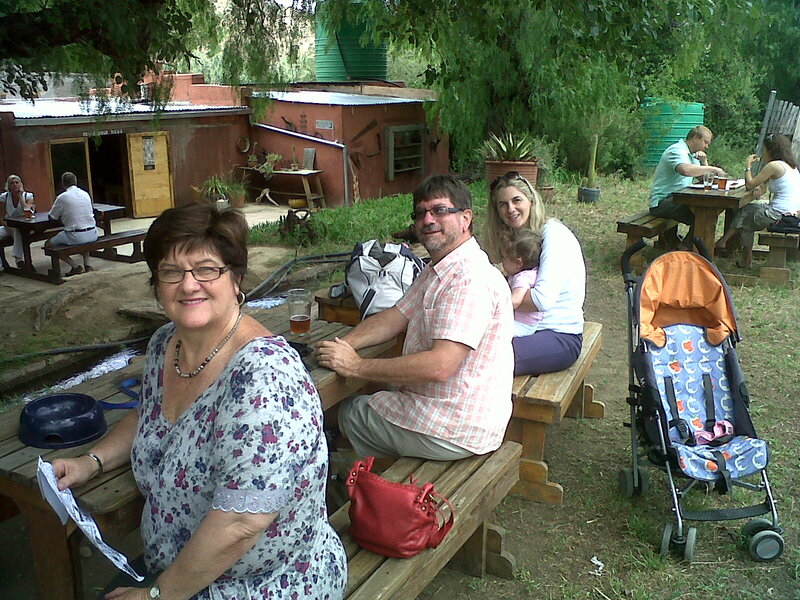 Sean returned to work in St Francis and Phillip headed off with friends to Bushman’s River. Somewhere in this time, we went to see the Blues Broers and Centrestage’s Extravaganza. New Year’s Eve we spent with the Clarkes at Bluewater Bay and New Year’s evening was supper with the Stapletons. The Reelers are due for supper tonight. And then it’s back to normal – whatever that is! If you missed this broadcast, you can listen now. Go to www.edlunnon.co.za/content/18 and click on the link there. 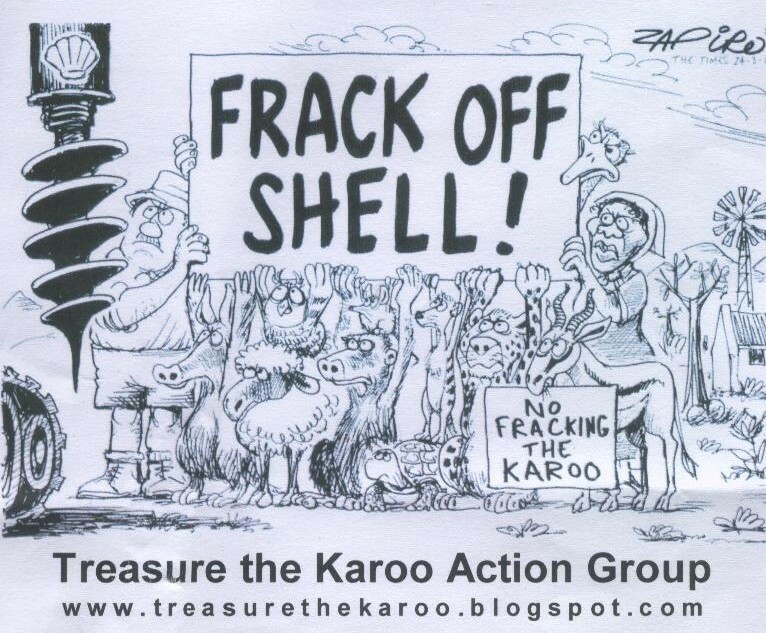 DON’T FRACK IN OUR KAROO!